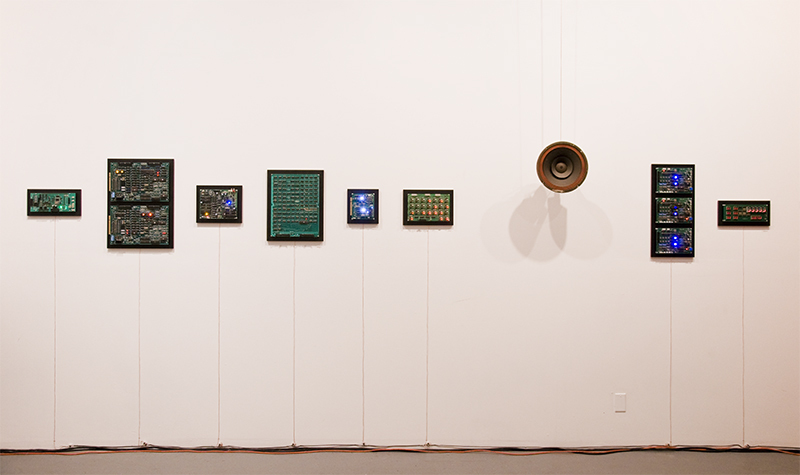 This work is a series of eight pieces made from printed circuit boards with modified circuitry featuring multi-colored rhythmically pulsing lights. The lights' rhythmic patterns suggest endlessly looping visual music. The pieces were we created from old video game arcade circuit boards and employ arduino microcontrollers to manipulate the lights. Circuit Boards has been exhibited at the 2008 Sound in Space festival, the 2008 Los Angeles Bent Festival, and the 2009 UCSD Spring Music Festival.